DEVON’s famous cheesemaker Quicke’s is hosting a series of Easter cheesesboard tasting sessions at the farm shop at Newton St Cyres near Crediton on Saturday 13th April from 10.30am. The idea is to encourage visitors to build a cheeseboard to compete with the chocolate this Easter. 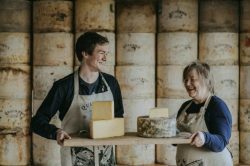 Run by Quicke’s Ambassador, Stuart Dowle, the event will feature some of Home Farm’s top truckles, alongside other local favourites from the cheese counter. This year’s tasting session has a special focus on Quicke’s territorial twosome, with Devonshire Red and Double Devonshire leading the line-up. A West Country take on Red Leicester, Devonshire Red is a vibrant, full-flavoured cheese, combining the hallmarks of this British classic with the distinctive characteristics of clothbound cheese. Its elegantly mellow counterpart, Double Devonshire, pours Quicke’s world-class milk into the traditional Double Gloucester recipe, delivering a true taste of Devon with a long-lasting finish. Quicke’s Farm Shop is stocked with regional artisan food and drink, from local ales, ciders and wines to beef reared on the Quicke’s Estate. It is open Monday to Saturday from 9am to 5pm and will be open from 10am to 4pm on Good Friday and 9am to 5pm on Saturday 20th April, closed on Easter Sunday and Easter Monday.